You are here: Home / Food + Drink / Join Us In Palo Alto, CA For Our Next #SweetsCrawl! Join Us In Palo Alto, CA For Our Next #SweetsCrawl! I’m very excited to announce the date of our next #SweetsCrawl reader meetup & local food tour! Our last event (almost a year ago!) in Los Angeles was a lot of fun and I’ve been looking forward to doing it again back home in the Bay. So mark your calendars and save this date: Saturday, June 20. This time we’ll be crawling the streets of Palo Alto, home to Stanford University and the center of Silicon Valley’s startup tech community. The downtown caters to their generally affluent local customers with a broad mix of restaurants, bakeries, and upscale food shops. Kevin used to work for a downtown Palo Alto startup, and I’m eager to show off our favorite local spots. As usual, the tour is free but I’ll be collecting a $20 donation for a worthy food-related organization working to improve the lives of people in the host community. This time we’ll be supporting Second Harvest Food Bank, an organization that provides free, nutritious food support to children and families in need from Santa Clara and San Mateo Counties. Kevin and I have donated to this organization for many years and support the important work they do to help raise families out of poverty. Donations are voluntary, but welcome. WHAT: The Palo Alto #SweetsCrawl is an Ever In Transit reader meetup, walking tour of vibrant downtown Palo Alto, and a celebration of all things sweet! 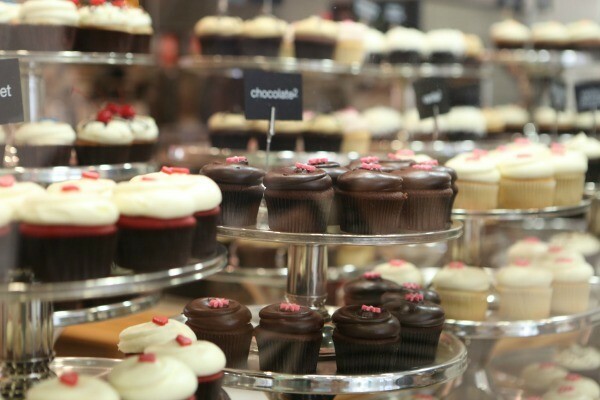 We’ll visit 5 or 6 shops across the city to sample locally-made cupcakes, chocolate, pastries, ice cream, and more. We’ll end the afternoon at a local pub (optional) to wash down the sweets with a good local beer or a glass of wine. WHEN: Saturday, June 20. We’ll start at 12:00 PM, end at about 4:00 PM. If you want to join me for lunch at the Downtown Palo Alto Farmers Market (near our start point), let’s meet at 11:30. Email me to let me know you are coming! WHERE: We will start and end in Downtown Palo Alto, just a 5 minute walk from the Palo Alto Caltrain Station–I’ll send you the exact starting point after you RSVP. Street parking is available throughout downtown but it is sometimes limited to two hours in the public lots so look for street parking or take Caltrain. COST: Free, but with a suggested donation of $20. All proceeds from this event will go to the nonprofit Second Harvest Food Bank. ARE YOU IN? Great! Please RSVP using Eventbrite. Space is limited. The tour is free, but bring money to sample something small at every stop, and a donation if you want to contribute to the fundraiser. Please eat a LIGHT lunch before we meet. I don’t anyone to pass out from all the sugar. Want to see what SweetsCrawl is like? Check out these wrap-ups from our walks in: San Francisco, Oakland, Los Angeles, and this reader-organized event in Atlanta.